The Maroon Bells-Snowmass Wilderness Area in central Colorado offers many trails that reward the hiker with some of the finest, and most photographed, scenery in Colorado. While this area is heavily used during most of the year, venturing out during off-peak periods allows for a small measure of solitude. 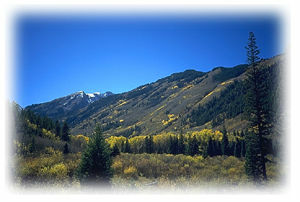 Access to the wilderness from the north is found 14 miles northwest of Aspen on Colo. 82. Turn left at the sign for the Old Snowmass post office. This road continues south along Snowmass Creek and turns from paved to well-maintained dirt. The trails of Snowmass ski area come into view further down the road. Large groves of aspen cover the hills on either side of the road making this an excellent, colorful route during the fall. About 12 miles in, the road dead-ends at a private ranch and parking area. This is the trailhead for the Maroon-Snowmass Trail. Camping is no longer permitted in the parking area. While the most common destination for backpackers on the Maroon-Snowmass is Snowmass Lake, a distance of about 10 miles, day hikers will find this trail suitable for a brisk hike. The creek cascades down a thickly wooded “stairway,” providing a sweet melody for the hiker, as the sharp, snow-capped, 14,000-foot-plus peaks of Capitol Peak and Snowmass Mountain slowly reveal themselves. An option is to take the West Snowmass Creek Trail, which shoots off the Maroon-Snowmass about one mile from the trailhead. 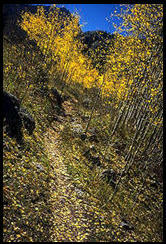 Several trails break off from the West Snowmass Trail. The trailhead for the East Snowmass Trail is found just before the parking area for the Snowmass Creek Trail. The steep East Snowmass Trail is 8.5 miles in length to Willow Lake and East Snowmass Pass. The Maroon-Snowmass Trail slowly climbs along the east side of Snowmass Creek for approximately six miles through thick aspen groves. Several smaller creeks feed into Snowmass Creek, and it was still running strong into October. In several places, the creek cascades down a thickly wooded “stairway,” providing a sweet melody for the hiker, as the sharp, snow-capped, 14,000-foot-plus peaks of Capitol Peak and Snowmass Mountain slowly reveal themselves. As one climbs through the forest, the stream falls away below, eventually spilling into a series of beaver ponds dispersed in a verdant meadow. Eventually meeting and then crossing the stream, the trail ascends via several switchbacks before forking about one-quarter mile before Snowmass Lake. The left fork continues to 12,461-foot Buckskin Pass, and beyond to Crater Lake in the heart of the Maroon Bells-Snowmass Wilderness. The right fork leads to Snowmass Lake. The many possible destinations of this trail system make this a heavily used area. However, as with all trails, the further one ventures, the less people one will encounter.